Because it’s their owner acting strange. There are three things I need to explain in regards to this phenomenon. First, in the animal mind, the form-of-a-thing, such as a human, cat, deer, etc, or sometimes even a log, is the confluence of two energies, predatory and prey. The ratio of these two energies compose a “being”, a specific emotional value, one that can change from moment to moment and hence the variety of responses a dog can manifest to the same person or thing. For example, a sensitive dog often becomes afraid of its owners if it sees them wearing a hat or a bulky coat, or comes upon them in an unfamiliar situation. In such a context the predatory value of the form is weighted higher than normal and this new energetic value knocks the dog out of balance because it does not associate that specific electromagnetic vibration as being its owner. Second, in the early imprinting phase of a dog’s life, the forms-of-things it experiences and interacts with solidify as a physical memory in its emotional battery. These physical memories become templates that are then applied to the forms of like-things because the emotional battery potentiates the brain. In the battery there are “squirrelzoids,” “catzoids,” “deerzoids,” “dogzoids,” “humanoids,” etc., etc., populating the perceptual catalogue. The first human a dog knows becomes the master “humanoid” imprint that is then applied to all other humanoids for the rest of the dog’s life and on which all subsequent experiences are catalogued in its emotional battery. (This is the essence of socialization. For example, if a dog is sequestered from other humans, it will grow up to weigh the subtle discrepancies between forms as more important than the broader generalities and perceives these lesser variants as predatory aspects, and so sensitive dogs are what I call “form sensitive”. They go by sight rather than by feel and by smell.) So when a dog is raised and socialized with a cat, this specific catzoid template is then applied to all other cats on sight and the dog “likes” cats (at least indoors, there could be a different template for cats outdoors because the ratio of predator/prey could be different given that cats are far more likely to run outdoors). If a dog was imprinted that deer = prey then this “deerzoid” template is applied to all other deer and the dog chases them on sight. A form-on-sight reflex is adaptive because in this way an animal doesn’t have to break down a form in its mind in order to arrive at an immediate impression of the emotional value of that thing. The value is acquired on sight. Now let’s put these three components together to understand the specific instance of a dog encountering a stranger at the door. For most dogs, for dozens if not hundreds, if not thousands of times, the humanoid at the door was its owner, the prime humanoid by which it will come to assay all other humanoids. Hundreds of times the door opens and there is the first humanoid coming through the threshold and lavishing the dog with praise and attention. “Hey Rascal, how ya doing, I’m back buddiiiieee!” And so the dog associates the humanoid at the doorway with 200,000 volts of energy; it can plug into this first humanoid because it can feel the preyful essence of its beloved first human because this form makes it feel grounded. Then one day many, many repetitions later, the door opens and OMG there stands a humanoid, for which the dog has 200,000 volts of attraction—and yet has no feeling because the discrepancy between its form and the default template is perceived as fast movement. Indeed it’s 200,000 volts worth of fast movement. And when was the first time the dog experienced a humanoid moving fast? When its owner acted strange, i.e. rushed at it really fast because the dog as a puppy was about to piddle or poop on the carpet, or about to tug on an electrical wire, or when s/he was first corrected for getting into the garbage, or gnawing on the sofa and so on. A dog has no idea that a stranger at the door is someone who doesn’t belong in the house or on the property. The dog is energized to 200,000 volts just like it is every time the owner comes home, and it is compelled to plug into the humanoid in order to ground out this energy. Some dogs will even run to another part of the house as if to “get” their owner and “let it know” that someone’s at the door. But what they’re really doing is feeling a pull to their owner because they can’t plug into the humanoid at the door. Other times soothing words from the owner, or even the stranger: “It’s okay Rascal. It’s okay” will trigger prey-energy value and this might help the dog feel grounded into the stranger. But otherwise the dog still has 200,000 volts of ungrounded energy to contend wit,h and in canines the behavioral/physiological adaptive response to this dilemma is to download energy by barking in order to decrease the overwhelming pressure of energy that’s not moving. (After all, barking at kitty did get it to move.) And sure enough the person might flinch or sweet talk (acts prey-like) and this gives the dog some degree of grounding and the energy subsides below a critical threshold that then does allow for contact. (Or if the energy stays high, the dog might then bite.) At this lower level, and because of the response in the humanoid, the person at the door thereby acquires a new electromagnetic emotional signature and in most cases the dog can compose in its mind a new “Being” for this owner-acting-strange humanoid. Interestingly, if one raises a dog to be socially confident and without intense greeting rituals when coming and going: then, unlike the average family pet, they tend not to bark at strangers. When I used to import Schutzhund-titled dogs from Germany, they performed all the protection routines beautifully, but because they were raised so holistically in their original trainers’ progressive sports-like way, they often wouldn’t bark at strangers, – even after months of living in a home and so this is where I ended up concentrating most of my training after installation. The SV (the governing sports body in Germany) even instituted a “watch dog” test so that its dogs would reliably perform this basic household service in addition to the exotic and advanced skills required of a working police dog. What good was all this fancy training if the dog didn’t bark at strangers? In your example of a dog having 200k volts of attraction to a stranger, but no feeling– what is the primary cause for the disparity between the internal template and the actual being? Is it the physical form, scent, the person’s intentions, or does it all play a part? Later in a dog’s life, are templates still formed? For example, if a 5 year old dog has never seen a horse before (but has seen a deer), would the dog apply the “deer template” simply because it’s the closest thing to that form? Would a new template form for something entirely novel like a snake? Last question: Can these templates alter over time? If a dog experiences a rush of predatory energy when first encountering a car, is the dog destined to *always* apply that same ratio of energy to every car it encounters even if all subsequent encounters with a car are lop-sided on the prey energy side of things? And on a more general level, is this why dogs can form fearful or aggressive behavior towards objects that were once considered harmless/normal? The last question is really interesting to me as I often hear of trainers using counter-conditioning and desensitization to help a dog with fears. In many cases the dog will make lots of progress but then revert back to the original fearful behavior suddenly– is this the dog returning to the original template that was formed? 1) In your example of a dog having 200k volts of attraction to a stranger, but no feeling– what is the primary cause for the disparity between the internal template and the actual being? Is it the physical form, scent, the person’s intentions, or does it all play a part? The primary disparity is in the form, the dog responds to the discrepancy via instinct and so cannot pick up the subtler “preyful aspects” of the persons’ body language and in particular scent. Then movement of the form can amplify the shock. Finally, the dogs’ barking can bring a person’s fear/intentions to the surface and so this too can add gas to the fire. There are also occasions when the dog smells and then erupts into barking; however this is a more refined elaboration of the same phenomenon. When the dog became grounded with the smell, nonetheless the connection is still weak, like a poor electrical contact, and now all of a sudden this can’t carry the surge of the strong emotional pull the dog now feels toward the stranger by virtue of smelling him, and so the template (which barely fit to begin with) no longer fits in terms of this increased load and so the dog all of a sudden sees the stranger moving fast. 2) Later in a dog’s life, are templates still formed? For example, if a 5 year old dog has never seen a horse before (but has seen a deer), would the dog apply the “deer template” simply because it’s the closest thing to that form? Would a new template form for something entirely novel like a snake? Everything has an energetic signature and so the first experience gives the dog an imprint, it’s like the immune system getting the shape of a foreign pathogen from the first exposure. A horse has a much stronger predatory component than a deer and the dog will be able to discern the distinction, although distance has a mitigating influence. The farther away; the greater the prey value in the mix, so a horse running at a distance would appear more deer-like and a deer-chasing-dog would probably chase it. However, when the dog got closer its prey-making mettle would be tested since it would have to deal with the shift in template now that they’re so close. Temperament makes templates (an emotional value of predator relative to prey) and can do so at any age. The more supple the temperament: the more the emotional value of a preexisting form can change. So yes, a new template can form later in life in response to a brand new form and also emotional values assigned to any given form can gradually shift as well. The form of every species has an innate and distinctive electromagnetic vibration (virtually speaking). A snake has a specific makeup but then on top of that there is the novelty factor in the dog’s experience and this will accentuate the snakes’ predatory aspect and the first imprint may more extreme for one dog than another. Also, if two dogs experience the same form at the same time, they will pickup a slightly different imprint by virtue of being an influence on the other so that they can fit together relative to that form. One will be the “up” polarity relative to the other as the “down” so to speak. 3) Last question: Can these templates alter over time? If a dog experiences a rush of predatory energy when first encountering a car, is the dog destined to *always* apply that same ratio of energy to every car it encounters even if all subsequent encounters with a car are lop-sided on the prey energy side of things? The permanence of any given template depends on how much it gets energized. So in order to compose a new ratio, the dog must apprehend the energetic essence within the form and this works just like the sense of smell. In smell, each molecule has a distinctive electromagnetic value (within its form) given the chemical bonds and their angles, and yet the sense of smell can perfectly apprehend the energetic essence of a molecule it has never encountered before and even though this chemical may have been produced in a lab by some exotic process and has never before wafted into any animal’s nostrils over the course of the evolution of life on earth. So the prey/predator ratio can shift but there is a tendency towards permanence because the original imprint becomes the path of least resistance and so will tend to get reinforced with repeated energizing. So a wolf encounters a healthy moose and this forms an imprint. And then when it encounters a diseased moose, it can discern the distinction and pickup the essence of the vulnerable moose by way of a discrepancy. 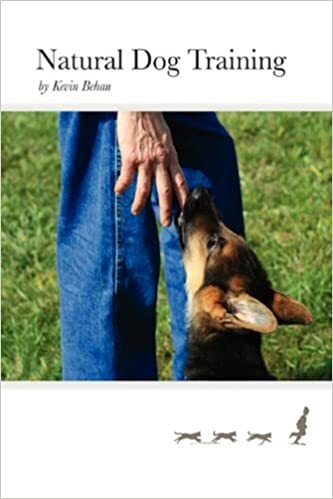 If the underlying template doesn’t shift, then the dog’s affection is specific to a particular horse, or bunny, and in specific situations, rather than horses and bunnies in general and under any and all contexts. In the case of the dog that comes to love horses, fear of the horse was converted via the hunger circuitry into a new value for the template. If this new template gets energized to a stronger degree then the old one, it will replace the old one in the emotional battery as path of least resistance. So if the prey value in the mix is roughly equal, but slightly greater than the predatory value, then we observe pure social energy. This is also related to why we humans need to use praise, food and toys in order to up our prey quotient and help a dog feel attracted to us since we are such overwhelmingly predatory beings. Wolves don’t have to do this with other wolves, and dogs don’t have to do this with other dogs since they have a much higher prey component in their energetic signature. Thus when an alpha canine “disciplines” an omega, it’s much easier for the omega to feel grounded to the alpha despite that whooping as opposed to experiencing the same degree of interruption from a “dominant” human. When a dog sees another dog on the horizon, the energetic signature at this distance is basically the same as seeing a deer because dogs have a four-legged rhythmic gait (prey) and with a big fluffy tail (in most cases) that waves in the air to boot. So dogs have a lot of prey value and this helps keep other dogs grounded to them. 4) And on a more general level, is this why dogs can form fearful or aggressive behavior towards objects that were once considered harmless/normal? Fear is ungrounded energy and therefore it can only be reinforced. Fear cannot be desensitized, calmed, allayed, forgotten as time goes by, gotten over, it can only be reinforced. Fearful dogs are very “hardened” in their fear. It’s like a callous over their temperament. So even when a dog with a fear imprint has a positive experience, this experience is stacked on top of the fear imprint and so the fear gets stronger, just as a building erected on a faulty foundation gets more and more out of whack the higher it goes. One indication that the dog is getting more fearful is that the dog is generating more and more personality, becoming more and more “friendly” in other contexts. Such dogs often can play with a toy by itself but this is actually the investment of a predatory aspect into the toy so that it becomes a Being with which the dog can now play. This is directly proportionally to the dog’s sensitivity to fear since it’s projecting a predatory value into these innocuous non-threatening situations just as its projecting a predatory value onto an inert toy. Personality, while an adaptive coping mechanism; is really a defensive response, and is predicated on fear. (This is why young puppies are both fearless and have less personality. As they get older, their nervous systems become more complex and they acquire resistance and fear, and they manifest more and more personality. In other words, personality is a vibration of the battery but not a true movement of deep energy.) So the more successful the dog is with its personality, the more its fear is being reinforced. In the short term it can look like the dog is getting better as its personality can glide over short interrupts in consciousness (like scooting itself over the slippery floor problem) but this is always adding up and sooner or later fear reaches critical mass in the battery and the higher process of the nervous system must invent an object for the fear to be vented toward in order to discharge the battery and find relief. Fear follows the path of least resistance and so often the invention will be a familiar template from way back when. We have to get below personality and create a new template by appealing directly through the temperament and changing the prey/predator ratios. Unless a new template is created that can carry more energy than the old template can relieve, the fear will return. To resolve fear, it must be turned back into that from which it came, i.e. a desire that collapsed. The good news is that desire feels better than fear. In my view, only hunger can turn fear back into desire, and since desire is energy of attraction that is based on hunger/arousal; unlike fear it can be satisfied. So if a dog will take food or bite an object in a fear inducing moment, the energy is becoming grounded and it is on the way to acquiring a new template. I should also say that fear of some object or place was really an invention of the nervous system to justify a download. Usually, the specific circumstances were not the real cause but merely the excuse and represented an opportunity to download. This is why it’s so important to help the dog move its energy by overcoming resistance. And why do dogs bark more at men? The question I have is: my son has moved back home for a while and, even though Diva was used to him visiting, she’s having a hard time with him being here all the time. She fear-barks at him and won’t come near him any more. She also has issues with the shower, i.e. she’ll fear-bark and back away when you come out of the shower. The method I use is to allow access to bathroom when I’m showering so she can peek her head in if she wants to and I let her lick my hair and skin also. My son is tres kewl and will follow this protocol with her (as long as he’s alone in the house!lol). I also suggested that he start taking her for walks, just the two of them. She is a sensitive girl in that, if my scent changes it throws her balance off. When I changed shampoos she would fear-bark and back away; one time I rinsed my mouth with peroxide and it really threw her off! Are there other methods we should/could be using to help her get comfortable with him? Well, this is going to sound strange perhaps, but have you noticed that kids in war zones don’t have fear responses to incidental things? They know where to direct their fear and so they are properly channeled in one way of looking at it. So when a dog exhibits fear toward superfluous details that aren’t particularly threatening, it’s helpful to teach them where their fear should really go rather than devising all these coping strategies that are actually accommodating their fear and therefore reinforcing their fear. This is why I recommend the boogey-man-in-the-woods routine to give a fearful dog something to focus on, and which can be successfully redressed. In other words, a dog is only able to express the deepest layers of the battery in a critical moment because this energy is reserved in order to address a crisis. In the absence of a real crisis to deal with, when the battery gets full (usually because of too much attention) then the Big-Brain has to INVENT a crisis in order to allow for a download. (I think Neil has written about it on his website so you can check in there and I’ll try to put something up here on the subject once I get my book done as well.) So give her something real to worry about and it puts the little things in perspective. Before you do that however she has to first learn how to successfully defuse danger. when comes to dealing with certain situations for instance, i walked my dogs with the help of a neighbor who wanted to take a walk to the new antelope valley addition that is almost completed. after saying good bye to my friend, i rounded the corner. there an Indian fellow came right up to me and my dogs. my big dog had a feeling and started to growl. the gentleman came right up to my face and my dogs face and said get your dog away or i will stab her. i told him to ##### and to beat it. my neighbor came around at that time and he hightailed it out of there. if it hadn’t been for sasha, he would have tried to do some kind of nastiness. fwiw…I consider you to be from planet dog and I consider that a tremendous complement. At any rate, your comment about dogs being socialized from puppyhood vs not and the imprinting. I believe that is why Diva fear barks at people and is timid of them. And also why she has issues when any “small” thing about you changes (i.e. smell as in coming out of the shower). And your comment about having to “invent” something to fear is also apropos to her. However, by “boogeyman-in-the-woods” do you mean hiding and jumping out at her suddenly? I would also like to add on a positive note: the last time we were down at the canoe portage and I did a little pushing with her, she was way more into it than in the past. She pushed so hard that she actually came up off her front feet! That’s a first for my girl and she repeated that a few times so I consider that to be progress indeed! Thank you seems to be such a pallid offering for your advice but I am grateful for it none-the-less. This is one of the best things there is on the internet to read about fearful dogs! And i’ve read them a lot… I am happy because finally it seems i can understand what is really going on in my dogs head. So when dogs bark at one another during play, they’re feeling what? A lack of movement, lack of momentum? Right. 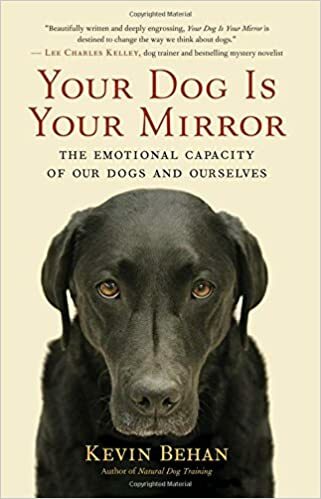 Note that the playful dogs when there’s an interruption in emotional momentum (which is affiliated with physical momentum via Pavlovian imprinting) generate a deep, metered bark because they associate the object of their attraction with full out running and a soft mouth. The bark being an indicator of emotional momentum and how easily the two dogs move together. And then in those circumstances when a dog is barking as it runs alongs with others, then it’s feeling a degree of momentum that it can’t easily handle and the bark is its attempt to keep up, or to make up the shortfall so to speak. Its mouth isn’t feeling as soft as it should be in order for the dog to feel fully integrated. So would you say that a thwarted or interrupted desire is felt by the dog as a lack of momentum, and that this feeling is virtually the same thing as fear? Yes, when a dog is attracted to something, his physical momentum generated to travel to that point, is associated with the emotional desire so as to become emotional momentum. Thus when the desire is thwarted, the dog is still stuck with that feeling of momentum. Under this condition I call it acceleration and if the sensations are too intense it can collapse the state of attraction which then produces fear. I like to give the example of driving a car. We’re wanting to go some where and the car is cruising along with a certain degree of physical momentum. Momentum plus desire is our system’s emotional momentum. Then when something interrupts our feeling of flow, like hitting a patch of black ice, it’s just as if the car has suddenly been knocked off track and accelerated in another direction and those sensations can collapse the feeling of flow and we become very fearful of this un-channeled energy, or acceleration, and up comes our DIS in order to restore equilibrium to the system and reacquire the original momentum in order to keep the system on track.